« Beauty + Basketball = saves lives!! This past month I have witnessed yet again just how powerful the platform of sports is as I traveled throughout South Africa and Namibia conducting clinics for various ages and using basketball as an avenue to teach valuable life lessons and build communities. In order to more accurately depict my experiences, I am going to break my travels into a 3 part series. The first section will be my time spent with our NBA personal over in South Africa, followed by my travels throughout Namibia, and lastly with the small NGO that I have worked with back in South Africa near the Swaziland border. Upon landing in Johannesburg, where the NBA Africa office is headquartered, I was quickly brought up to speed on the “State of Basketball in Africa” especially in regards to South Africa and Namibia. Three things impressed me about how the sport has progressed since my last visit in 2009. First, I was encouraged to hear that the NBA games are now being aired on an ordinary national TV station, making it more accessible to the average population in South Africa. It is a country that joins the rest of the world in their love for football (soccer), add to that an infatuation with rugby and cricket, and basketball naturally takes a back seat in their sports realm. Having games on TV raises the awareness for the game that leads to an increase in participation, which brings me to my second point: the increase in organized leagues, especially for the youth. The growth of any sport has to be done organically and with a huge emphasis on grassroots development. Providing more structured leagues for children to play in at an elementary level will translate to better high school players, more competitive national teams and most importantly a greater pool of the population to become coaches and invest back in the next generation. My final notable observance was the extraordinary increase in the number of young girls now playing basketball! The globalization of women’s basketball is quite fascinating to me, and South Africa holds a truly unique chapter in that book. Since the invention by Naismith in 1891, American women went from playing 3-on-3 in bloomers to the universal game, uniform and rules we know today in the WNBA. The South African Basketball Federation, on the other hand, was not even established until 1953, a time when the country was torn apart by Apartheid. During this period, women were encouraged to play in the similar, yet very different sport of netball, and even then it was limited to “whites only” excluding a majority of the population. Nelson Mandela utilized the platform of sport to unite the country during the 1995 Rugby World Cup and since then opportunities and equality have been on an upward journey. One thing I love about Basketball Without Borders and the NBA’s dedication to the grassroots development of the game of basketball is that girls are included in their vision! Our two-hour drive took us outside the metropolitan district of Jo-berg, passed the platinum mines to a beautiful outdoor court where I was greeted by an entire group of young, energetic girls ready to participate in our skills clinic. Historically my time in South Africa has been working with only the boys and maybe a girl or two speckled in, so I could barely believe my eyes when I saw an entire court filled with the Platinum All-Stars of the Royal Bafokeng National, the select girls from the north region!! 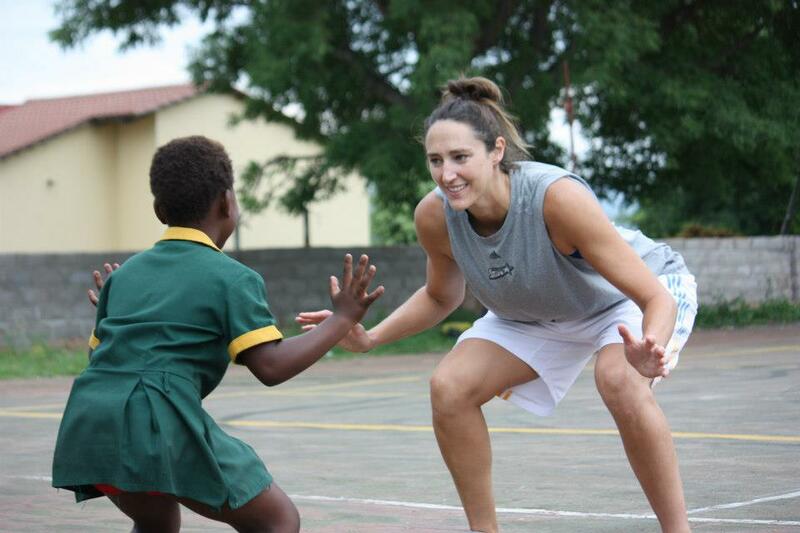 Like many of the girls attending, Elri Liebenberg, has only been playing basketball for a few months because previously netball was her only option. At 6’8” she played the “goal shooter” position her whole life, so shifting over to basketball she already has a naturally good shooting form. Had she been born in the States, she would have been groomed since elementary school, filtered through the AAU system as she grew up, and by now be getting scholarship opportunities from every major university, but instead she was raised playing netball, started playing basketball at the age of 16 where scored 42 points in her first game, and can still potentially get a scholarship to play but it will be a much longer journey for her to get there. I am not discrediting the kids that I work with back in the United States, but there is just a different energy and enthusiasm that accompanies being given an opportunity that has historically never been afforded to someone before, and the pure passion that these girls displayed captured that ideology! The exciting thing about working with these young girls right now is that they are on the cusp of a learning curve to establish success on the national level at a rate that exists in few places in the world. If you wanted to see a tremendous return on your investment in coaching, spend a little time in Africa. Going from nothing at all to anything, by sheer definition you will see growth at exponential rates! Right now, the country in Africa whose President and Minister of Sport commits to investing in girls basketball will quickly dominate the sport on the continent, I know a lot of young girls who are hoping that will be South Africa!! This entry was written by RuthRiley, posted on November 26, 2012 at 5:03 pm, and filed under Uncategorized.